If you have a missing tooth (or teeth) there are several ways in which it can be replaced. One of which is a dental bridge. Dental bridges work to restore your smile and maintain the appropriate face shape. They can also help you chew your food efficiently, speak and place the jaws together when biting, which helps prevent other teeth in the mouth from moving out of place. Essentially, if you are missing any teeth, considering a dental bridge has several benefits. As you may, or may not be aware, not all dental bridges are the same and you have a few options ehen it comes to this particular restoration. Acrylic temporary bridges:these are a temporary option before the final restoration is fitted. They last between 6 months and two years. These bridges are made from a softer material than the other types of bridges available and will, therefore, appear slightly bulkier than the final restoration to maintain strength. If you have this type of bridge, you should take care when chewing and opt for soft foods during this phase. Traditional bridges: Traditional bridges are the most common type of bridge. These bridges consist of one or more false teeth and are held in place by dental crowns. These dental crowns are also called abutments, and they are cemented onto the teeth adjacent to your missing tooth. The Hybrid:There is a new way to fit dental bridges which utilizes titanium. This is a little-known option and yet has some great benefits in comparison to regular bridges. At Extreme Dentistry, we are one of the leaders in welding these titanium bridges and are the practice of choice should you choose this fantastic option. Titanium and titanium alloys, based on their physical and chemical properties, appear to be especially suitable for dental implants and prostheses. Slowly but surely, they are becoming the material choice. 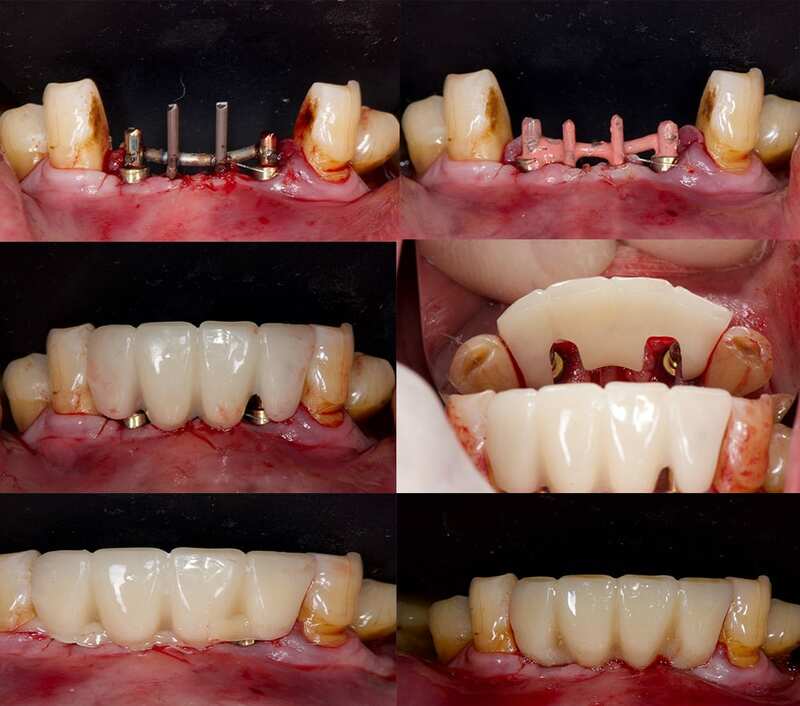 Traditional fixed bridge reconstructions on multiple-unit implants usually involve a technique that requires a wax-up and casting for the substructure. Veneering with either denture teeth and resin or ceramics is then accomplished for case completion. The new, more efficient way of achieving a dental bridge is by means of titanium. It involves a computerized milling procedure which creates a substructure from a single piece of titanium. This offers an alternative to the conventional casting process. One of the main benefits is the improved potential for fit and eliminating distortion. A custom-made titanium framework is used to support your new acrylic resin teeth. This type of bridge lasts for a significant amount of time: between 5-10 years. When the time comes for a replacement, a straightforward and inexpensive resurfacing procedure is often all that is needed, whereby the existing metal framework is re-used, and the new acrylic tooth/ teeth attached. It is clear to see that the titanium method is simple, steady, longwearing and works out to bw affordable in the long run. If you are interested in having a bridge. Titanium or traditional, Extreme Dentistry can offer great quality bridge restorations.